Ahh. 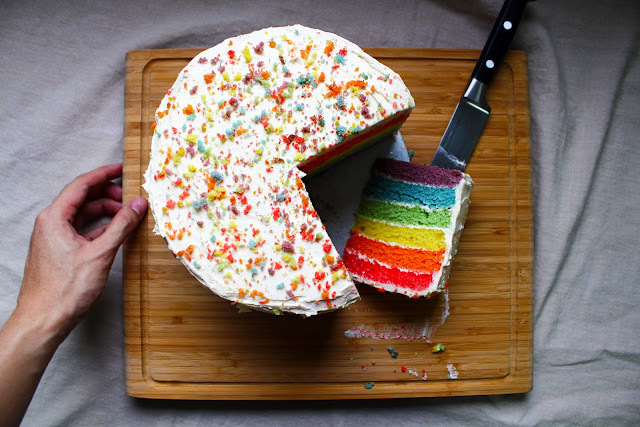 Quite a few of you have asked me to bake this, I've succumbed to you guys, and there you have it - the almighty Rainbow Cake a.k.a the happiest cake on this planet. I mean, who in the right mind wouldn't want a slice of this unicorn fart. Sorry, I should mind my language since we are talking about food. Okay, some of you might be daunted by the idea of baking this cake. Don't worry, this is way easier than it looks (you just need a little more patience). For the smiles (or maybe girls) you can get with this cake? Worth it. Brighten up anyone instantly with this slice of heaven. Would you just look at this? Damn girl. 1. In a bowl, mix vanilla extract and milk together. Divide mixture equally into 6 different bowls. 2. Thanks to primary school education on the colour wheel, you can conjure 6 colours from just 3 gel colouring: Red, Orange (Red+Yellow), Yellow, Green (Blue+Yellow), Blue, Violet (Red+Blue). Mix one colouring into each milk mixture. 3. In a mixer, beat the unsalted butter until creamy and pale on medium-high speed, about 3-4 minutes. Add in the caster sugar and mix for a couple minutes more. Add all 6 eggs into the mixture. Incorporate the self-raising flour in 2 batches. 4. Divide batter into 6 equal portions (use a weighing scale to be precise). Fold in each portion with the prepared milk coloring. The colour of the batter might fade a little, adjust and add more colouring if needed. Take into consideration that it will turn out few shades brighter after baking. 5. Grease each cake tin and line with parchment paper. Pour in the batter and smooth the tops. Bake for approximately 10 minutes in a preheated oven of 170C, or until a toothpick comes out clean. Set aside and cool for 10 minutes before removing from cake tin. 6. Using a knife, trim the slightly-browned tops and the sides. You might want to use something (like a plate about the same size) for reference. Keep some of the trimmed excess (cake bits) for decorating. 1. In a mixer, beat the unsalted butter until creamy and pale on medium-high speed, about 3-4 minutes. Add in icing sugar 3 batches. Add in vanilla extract, then milk, adding one tablespoon at a single time. If the buttercream is too dry, add milk, one tablespoon at a time. If it's too wet, add approximately 2-3 tablespoon of icing sugar at a time. 1. On a cake base, apply some buttercream so the cake will not move around when you are decorating. You may want to use a cake decorating turntable and flat-bladed knife if you have one. Lay the violet layer first, apply a crumb-coat by spreading a thin layer of buttercream first to "stick" the crumbs, before applying a more generous layer. 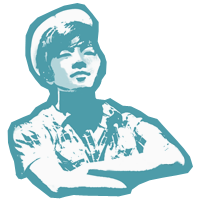 Repeat with each layer - blue, green, yellow, orange, and finally red (use the picture as reference). Lightly pressing down the cake after adding each layer. 2. After all layers are stacked, trim the sides if needed. Apply a crumb-coat on the whole surface and refrigerate for 30 minutes. Add a neat, thin layer of buttercream and refrigerate for another 30 minutes. Add a final layer of buttercream, smooth the sides, and sprinkle the cake bits on top. You can use rainbow sprinkles, or whatever you like. Really. Refrigerate for 1 hour before serving. There you have it. 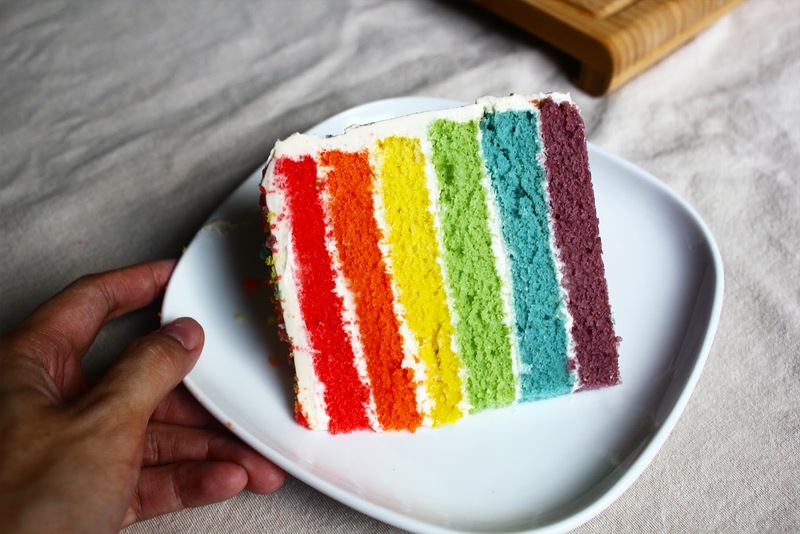 Your very own rainbow cake. Made from scratch. Now go impress and impress someone's day.